The 2018 Lunar Rendezvous Advisory Board members wear big smiles as they gather for their annual Distribution of Funds Coffee at Bay Area Museum. 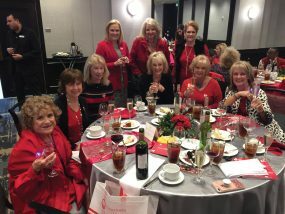 They are, from left, front row, Dinah Matthews, Jill Reason, Peggy Clause, Annette Dwyer, Michael Landolt; back row, Mary Ann Shallberg, Kathie Reeves, Kim Barker, Jana Miller and Ann Wismer Landolt. 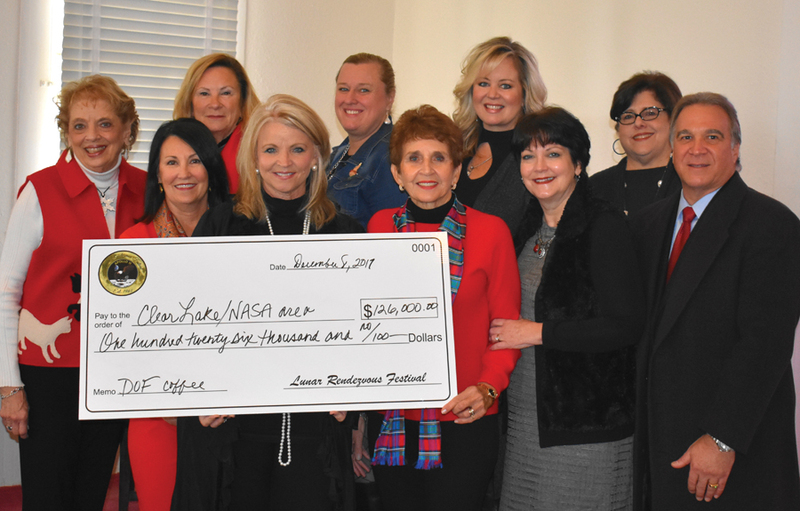 A total of $126,000 in funds raised during the 2017 Lunar Rendezvous Festival were distributed to area Bay Area 501(c)(3) organizations and need based scholarship recipients during the annual Distribution of Funds Coffee held at Bay Area Museum. Nine $8,000 college scholarships were awarded to need-based college bound Clear Creek ISD students. Funds also were distributed to Bay Area Turning Point, Assistance League of the Bay Area, Communities in Schools-Bay Area, Bay Area Houston Ballet & Theater, Bay Area Youth Symphony, Clear Creek Education Foundation, University of Houston-Clear Lake, and Houston Symphony League Bay Area. The distribution comes as Lunar Rendezvous begins preparations for its 2018 festival this spring with its annual kickoff party scheduled Sunday, March 25 at UH-Clear Lake. 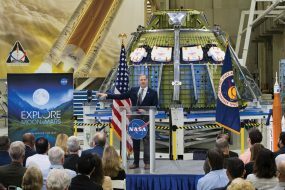 Now in its 53rd year, the Lunar Rendezvous Festival is dedicated to providing community based support including scholarships for higher education, youth development, and educational programs, and funding for the arts and historical preservation in the Bay Area Houston/NASA area, Festival Chairman Dinah Matthews pointed out. The Lunar Rendezvous Festival began in 1965 as a 501 (c) (3), non-profit organization formed to preserve the rich history and many accomplishments in the space sciences made in the Bay Area. The first festival, which took place over two weekends in June of 1966 and included more than two dozen events, was a salute to the space program’s historic 1965 rendezvous of Gemini VI and Gemini VII in space. Since its inception, Lunar Rendezvous has hosted fun and entertaining festivals enjoyable for the entire family. Each year hundreds of volunteers join together to promote charity, and to celebrate, and honor our community.